The Central Government vide Notification No. 66/2017 - Central Tax dated November 15, 2017 has notified the registered person who did not opt for composition levy, as the class of persons who shall pay the CGST on outward supply of goods at the time of supply as specified in Section 12(2) of the CGST Act, 2017 including in the situations attracting the provisions of Section 14. Section 12(2)(a) of the CGST Act, 2017, prescribes time of supply for goods as the date of issuance of invoice or the last date on which invoice is required to be issued. 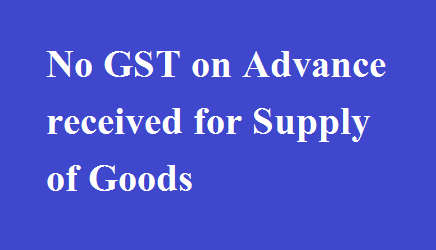 Thus no GST will be applicable on advance amount received in respect of Goods. It may be noted that this notification has been issued in suppression of earlier Notification No. 40/2017 - Central Tax dated October 13, 2017, where in the stated benefit was allowed only to small assessees whose aggregate turnover in preceding financial year did not exceed Rs. 1.5 Crore. Now, the provision has been generalised for all the registered assessees other than composition supplier.